We’re roughly 10 percent of the way through the NHL season, and that means it’s time for some teams to panic. Not really, of course. Even in this abbreviated season, jumping to conclusions based on four or five games would be downright irrational. 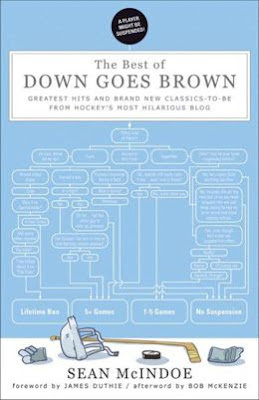 So any of you hockey fans who are completely rational when it comes to your team can go ahead and stop reading right now. The other 98 percent of you still with me? Good. Let’s hit the panic button. One note: We’re focused here on teams that are struggling relative to expectations. The Blue Jackets may have been iffy so far, but they’re clearly in rebuilding mode, and just about everyone had already picked them for last place. A team like that can’t be considered to be in panic mode by any reasonable definition. to realize he was still in Edmonton. 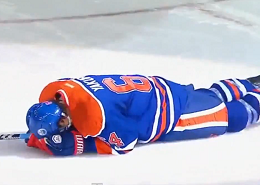 Edmonton Oiler rookie Nail Yakupov managed to make himself the talk of the hockey world last week when he celebrated a last-second goal against the Kings with an extended slide down the length of the rink. While many chalked the moment up to youthful enthusiasm, others weren't so kind. Don Cherry called him an idiot, and many fans of other teams were even harsher. But was the criticism justified? After all, has anyone ever actually documented what exactly a player is allowed to do when they score? They have, as it turns out. But apparently Yakupov didn't get the memo. So for the benefit of him and any other rookies who missed it, here's the official NHL etiquette for celebrating. Do: Celebrate your 50th goal of the season by pretending that your hockey stick has caught on fire. Do not: Forget to check your insurance company's fire policy first, to make sure they'll eventually replace your stick with one that can still score goals. Do: Borrow the signature celebration of the Green Bay Packers by leaping into the first few rows of the stands after scoring. Do not: Try this in Toronto during the opening ten minutes of a period, since you'd prefer to land in an area that actually has fans. Do: Celebrate enthusiastically when you record a hat trick. Do not: Use up all of your energy on that celebration, since you'll want to save some for your second shift against the Flyers defense. Grantland weekly grab bag: Was it ever OK to use that breakaway move in NHL 94? This week we're debuting what we're hoping will become a weekly grab-bag style feature at Grantland. This time around, I tackle pressing issues like Nail Yakupov’s celebration, Don Cherry’s missing chair, whether it was OK to use that breakaway move in NHL 94, and the Calgary Flames' legendary "Red Hot" video. red lights than Cory Schneider. The NHL has returned to action after a lengthy work stoppage, and for many teams the first order of business was to get to work on repairing their relationship with angry fans. Whether it was free tickets, discounted merchandise or meet-and-greets with players, just about every team was trying to earn some positive publicity. Of course, some franchises were more creative than others. Here's a look at how some of the teams around the NHL are trying to make things up to their fans. 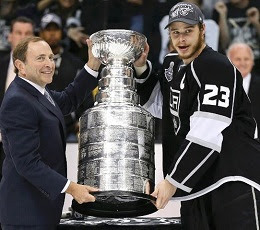 Los Angeles Kings: Diehard fans will receive a complimentary DVD titled "The LA Kings from May 2012 to today: A complete history, as far as you know." New York Rangers: Coach John Tortorella will answer one question from each of the 17,000 fans in attendance during a special pre-game event that's scheduled to last five minutes. St. Louis Blues: In a special post-game auction, fans will have a chance to bid on the game-worn jerseys and equipment of the various opposing players who have been undressed by Vladimir Tarasenko. Phoenix Coyotes: The first 10,000 fans get to try to explain the economics of hockey in Phoenix to the remaining 2,400 fans. We all know that MLSE stands for “Maple Leafs Sports and Entertainment”, and I think we can all agree that they’re pretty incompetent at the whole “sports” part of that equation. So maybe it's no surprise that they've apparently shifted their focus to the "entertainment" side. And if so, I suppose getting into the movie business is a natural extension of the brand. But all that said, does anyone else find this trailer for the new MLSE movie a little… odd? Too soon, MLSE. No, literally… too soon. Follow @blogesalming. That means you too, @strombone1. After an exhaustive six-hour training camp, the NHL makes its long-awaited return Saturday. And while it’s been easy to forget over the past few months of lockout negotiations between grim-faced men in suits, hockey is a sport played on ice by actual hockey players. Let’s take a look at some of them now. Here are 10 players who’ll be especially interesting to keep an eye on over the next few months, including the selfish and spoiled PK Subban. 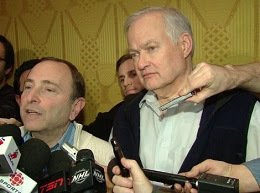 Hey, did you hear that the NHL lockout ended? It totally did! In fact, after four months of hearing about how far apart the two teams were, on Saturday night the deal actually came together kind of quickly. Follow @blogesalming or Dave Nonis will take your job. happen if Gollum ever teamed up with Han Salo. The NHL and NHLPA finally reached an agreement over the weekend, and the resulting new CBA doesn't sound like it will contain anything unexpected. In fact, it's pretty much the deal everyone had been predicting for months. Or maybe not. DGB spies got their hands on the entire top secret document, and it turns out that it actually contains a few surprises. Here are some of the more interesting details that haven't made their way into public reports yet. There's a strict confidentiality clause in which both sides agree to never publicly acknowledge that nobody ever actually understood what "make whole" was supposed to mean. The deal sets aside a significant sum of money to donate to charitable organizations helping those most desperately in need of urgent assistance: reporters who are slightly tired and cold. The two sides agree to pay for all travel expenses when federal mediator Scot Beckenbaugh eventually returns to fight crime on his home planet. In a message aimed at all the league and team employees who took pay cuts or were laid off entirely, the document includes a photo of Jeremy Jacobs shrugging his shoulders while sitting on a giant pile of money. For reasons nobody seems to be clear on, half the document is made up of knitting patterns for Steve Fehr's sweater collection. Classic include a team that never makes any. A new year has arrived, which means that it's time to take one last look back at the one that just passed. Unfortunately for hockey fans, most of the action in 2012 took place over the first few months thanks to a lockout that made meaningful news hard to come by later in the year. Then again, after 12 months marked by disputes over long-term contracts, maybe it's only fitting that an NHL Year in Review column would end up being heavily front-loaded. 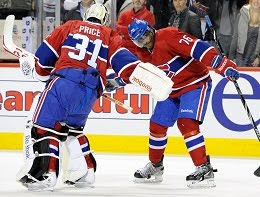 January 2 - The Winter Classic ends with a dramatic game-ending penalty shot save by Henrik Lundqvist that experts describe as a Hollywood-style ending, if Hollywood movie stars were better looking. January 23 - Tim Thomas attempts to send a political message by refusing to join his teammates in a meeting with President Barack Obama, making him the year's second most famous Massachusetts-based conservative to fail to get anywhere near the White House. January 26 - The NHL all-star draft wraps up much quicker than usual when team captain Zdeno Chara uses the first overall pick to choose "Every single one of you, does anyone have a problem with that?"